I was in defensive, art historian mode. I had swung from denial to the anger stage of grief. Only after she had hung up did I cry. 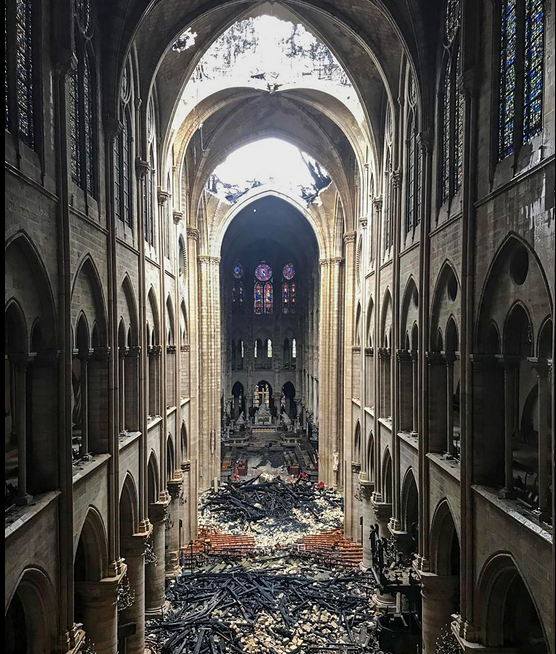 I am enough of a medieval art historian still to know that cathedrals burned on a regular basis in the middle ages. Everything we see from that time period is, first of all, fragmentary, and second, the result of a rebuilding campaign, usually prompted by some disaster or other. Cathedrals are generally monuments to human determination and endurance rather than to any illusion of permanence. As a student both of medieval architecture and of war, I have seen many images of the destruction of major monuments. The cathedral of Coventry was utterly destroyed in World War II and is now rebuilt. Most of the churches in Cologne, Germany, were rebuilt following their destruction, many in a modern style and from their own rubble, the new stained glass windows a kind of crazy quilt pattern of the broken shards. Both the Germans and the Allies had agreed to spare Florence on account of its historical and artistic importance but the Germans compensated for this by bombing all the villages in a ring around the city and blowing up the bridges. (The heartbreaking story of the destruction of the Ponte Santa Trinitá, designed by Michelangelo, is in this book.) A man in one of the bombed villages found the fresco of a streetcorner shrine broken off its wall from the concussion of the bombs and shattered at the base. The man, a restorer, his own life shattered around him, gathered the pieces, took them by bicycle to his workshop, and put the fresco back together. This is resilience and courage at a time when things look impossibly dark. Today the interior of Notre Dame, stripped of its embellishments, the vault at the crossing fallen, light pouring onto a floor filled with rubble, looks – at least to me – pure and noble. Stark, like the bones of trees in winter. And on the altar, still there, is the 18th century sculpture of Our Lady, wailing over the body of her son. It is Holy Week, with all of its despair … and all of its promise. Weeping may fill the night, but joy comes in the morning. You are currently reading Terrible Beauty at Susan R. Dixon.